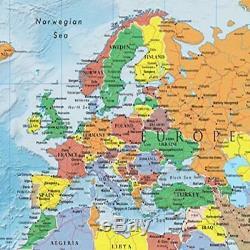 48x78 World Classic Premier Wall Map Mega Poster (48x78 PAPER). Model - WOR CL PREM LG LAM. Item Dimensions - H 0 inches L 78 inches W 48 inches. Huge Mega World Map Poster Mural. The Largest Rolled World Wall Map on! World Map now printed on 100lb Poster Paper. Packaging issues are fixed - now ships in protective plastic sleeve! Up-to-date and current huge world wall map. 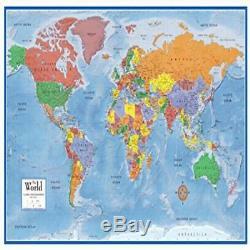 48x78 World Classic Premier World Wall Map Mega Poster. This elegant, richly colored classic-style Premier Series World Map features the incredible cartographic detail that Swiftmaps has been known for. The map features a Miller Projection, which reduces distortion of land masses as they near the poles. The amazing 3D visual ocean and land topographic shading will turn heads as something few have ever seen. This is the newest technology in World Mapping and Swiftmaps is happy to be leading the way in North America! Printed on quality 100lb top-coated poster paper for years of enjoyment! Only the best from Swiftmaps line of trendsetting wall maps!! We are also using a new heavier-duty 100lb poster paper with two-sided UV protection! You asked and we have answered you - our loyal customers! Typically arrives within 5-10 days. We usually respond within a few hours 24/7 including weekends. About US We are U. Based, we are here many years having more experience than others coming from other countries, we are real people like yourself and we strive to help the best possible way we can to you. 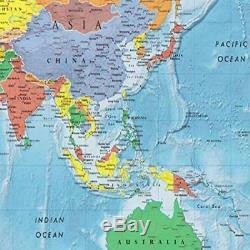 The item "48X78 World Classic Premier Wall Map Mega Poster (48X78 Paper) Swiftmaps" is in sale since Tuesday, December 5, 2017. This item is in the category "Home & Garden\Home Décor\Posters & Prints". 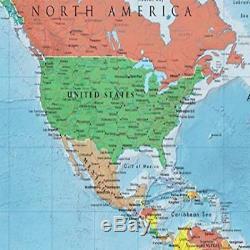 The seller is "luckyonline" and is located in United States.